I am sitting in a rocking chair, holding a baby girl who lost all her security this week. She is the same age as my own daughter, about 1 1/2, and doesn’t even have a blanket to offer comfort. 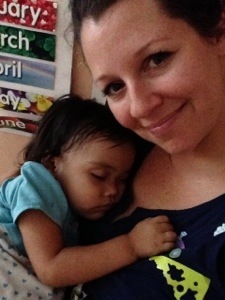 Naomi’s mother brought her to this children’s home three days ago and left. Unlike many children who arrive, Naomi is fortunate to have her siblings, three sisters and a brother, here. But she is no less terrified. She cries for her mother most of the day and most of the night. She hasn’t been sleeping. She has an unnerving, rattling cough. She is weak, listless, and can barely walk. As we washed the lunch dishes today, I heard her crying in the nursery (a term I use loosely, only to delineate it as the babies’ room). Naomi was sitting alone, holding a broken baby doll. The caretakers had left her crying quietly, not for lack of concern, but because she cries whenever they hold her. Besides, they have too much mopping, washing, cooking, etc. to rock a baby. Who better for the task than a mother who misses her own? That is, after all, why I came! So here I’ve been for over three hours, rocking this sleeping child and pouring into her all the love and comfort I have. What love, strength, and wisdom her mother must have to leave her children here together, giving them their best chance at survival. Such a selfless sacrifice. Years ago, a Father also gave up His Son; not for the child’s survival, but for the salvation of our hearts. These orphans, and their parents, are giving me a deeper understanding of the sacrifice God made for us, His wayward children. For God so loved the world, He gave His only Son, that whoever believes in Him will not perish but have eternal life. A king’s ransom for my petty soul. How can I not give of myself to His precious ones? 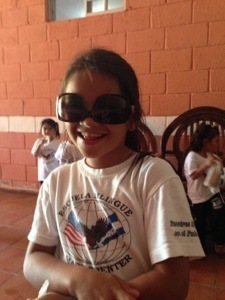 Naomi and her siblings (Esther – 8, Luis – 7, Loran – 5, and Joana – 4) are at Heart 2 Heart temporarily. To stay, they must have financial support, approximately $250 per month to clothe, feed, and educate each child. That’s an added monthly expense of $1,250 for this ministry. If you feel a tug to help the orphanage, please visit H2Hcv.org. Any amount makes a difference – $20, $50, anything. Although these kids aren’t yet on the website, look through the pictures. You will fall in love with all the children, I promise! With a sigh and a quivering voice, my 6-year old plopped down and said, “I’m sad because I don’t have any talent.” Parenting an emotional roller coaster is never dull! My first inclination was to squelch the heck out of that ugly lie trying to take root within my daughter. Then I wanted to show empathy with stories of my own talentless youth, but I held back. I listened and I silently prayed. Impulsive Leslie was terrified of this newfound technique. When it was time to respond, here’s what God, through me, shared: Sure, there are lots of people who have cool talents they get to show off. Dancing, singing, doing gymnastics and magic tricks, playing instruments – they’re all performing arts. And they’re fun to watch. Everyone has talents, but we can’t see every talent. Some people are good listeners, encouragers, builders, writers, you name it. And many of us have no idea what our talent is. Take Moses for example. He was chosen by God to be one of THE great leaders in Biblical history. If he didn’t do what God needed him to do, God’s people might not have survived and God’s great rescue plan might not have worked. He chose Moses because Moses was a talented leader. Only, Moses was terrified to speak in front of people, something his job required. Did God stop there? No. He chose Aaron to speak for Moses. Aaron was a great public speaker, but he was no leader; Moses was a leader, but he stuttered. Together, their talents complimented one another and God’s work continued. In the same way, we can pray that God will reveal to us our strengths and talents so we can do our best work for Him. “I still really want to be a gymnast. Maybe gymnastics is my talent?” said my 4-foot-something first grader. As she skipped and tripped downstairs to practice cartwheels, I was left thinking about talents, about our childhood quests to discover our specialties, our wishes to be something greater, and the circumstances that tame the fires until we live to survive instead of striving to succeed in our gifts. This past week, in preparation for my trip to Honduras, I shared with my daughter pictures of the children I’ll be visiting. I asked her to write letters to a couple of them, to tell about herself and ask questions of them. She loved the idea of encouraging these kids and finding areas of commonality. Then she decided perhaps she could ask a few friends at school to also write letters. Before I knew it, she had a plan. With her teacher’s permission, she would tell the class about my trip, the school, and the orphans, and ask her whole class to write letters. Her inspired teacher took it one step further and invited me to visit the class, talk about Honduras, and help the students write notes as part of a Social Studies lesson. It was a treat to see the children’s eyes light up at the pictures and read the notes they wrote to kids half a world away. More amazing to me, however, was to see my own daughter, a girl who thinks she is without talent, guiding, inspiring, and delighting her classmates with her vision for spreading love and justice. She might figure it out tomorrow, or maybe not for dozens of years, but like Moses, Aaron, and each of us, God indeed filled this girl with talent. The question is, what will she do with it? Will the flame continue to burn or will the passion be snubbed out by the lies of “I’m not good enough”? What do any of us do with the talents we were given? Do we spend our lives seeking them, improving them, using them for good, or do we turn our backs for fear of comparison, judgment, or failure? Rather than assume, like Moses did, we aren’t equipped, we should step faithfully toward our talents and let God give us the support needed. Thus sums up my 6-year old’s sound reasoning about her mother’s departure. And I completely understand. I don’t want to leave my family, but I really want to be where God is sending me. Preparations are in full force and the reality of leaving these girls is hitting pretty hard. Meredith is facing it with her usual practicality, but even she is starting to show signs of weakness. Audrey, at almost one-and-a-half, is blissfully ignorant of the facts, but I see her watching the rising stress levels in our home. She very bravely and happily enters the nursery rooms at Bible study, MOPs, and church, and remains cheerful throughout my various meetings. I pray her usual confidence isn’t disturbed after our separation. And then I realize I’m probably overthinking this whole situation. When Meredith was this age, I traveled regularly for business. Granted, the trips were shorter (usually 3-6 nights) and domestic, but far more frequent. Plenty of mothers leave their very little ones to travel for any number of reasons. As with all transitions, success (or failure) depends on how we face it. So, rather than dwell on the loneliness of leaving my family or on thoughts of them missing me, I will pray God makes the time move quickly for them, keeps me too busy to notice, and fills all of us with an abundance of peace. A kind friend offered a suggestion her children loved when they were young, long before she became a grandmother and mentor to younger women: leave an envelope for each day of the trip. My family can decide what time to open each (though, given the hectic nature of their schedules, I can predict when said opening will occur!) and discover messages and items from Mommy. Stickers and pencils, money for that coveted lollipop after ballet, hearts under pillows for good sleep, notes of encouragement, a Bible verse we can all memorize during the week … 10 days, 10 envelopes, and less than a week to prepare. I just need to find a way to fill an envelope with kisses! If you were leaving, what would fill envelopes for your loved ones? What would be in the envelopes to brighten your days if you were the one staying behind? People might call me a lot of things, but “athletic” is not one of them. Yet, somehow I got snared into playing softball for many years of my youth. I was pretty horrible at the sport since I could never master that hand-eye coordination bit. During many games and practices, I heard my dad holler from the sidelines, “Follow through. Follow through the ball when you swing!” I just wanted to make a hit, let alone keep swinging! Then there was golf. What a mess I was! In retrospect, I feel bad for my father. His wife and first two daughters joined him in the game from time to time. But there I was … defective. “Follow through. Follow through the ball when you swing!” If I followed through anymore, I could have dug to China for all the grass I scooped on my swings. But that blasted ball just sat on its perch, taunting me. Learning to follow through turned out to remain an elusive lesson for me in life, as well as sports. As I neared the end of my college career, rather than firm up relationships for the long haul of life, I pulled away from the friends on whom I had depended for so long. Saying goodbye was hard enough; I suppose my subconscious tried to protect me from the impact. A couple years later, I packed up my belongings as I left behind my New York City apartment and roommate. But in an effort to steel myself for the departure, for weeks prior to my move I had closed myself off to the city and friend I so dearly loved. I quit early on the relationships and experiences because I was unable to follow through. It took many years for me to recognize and address this personality flaw in myself. I caught on in time to follow through at the last job I held before my second child was born. I prepared myself to walk away from my career with a sense of pride and accomplishment, knowing I had done all I could do. It felt great … my personal home run! Right now, I’m once again having trouble following through on life. 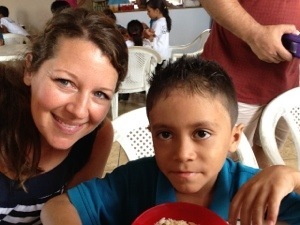 I am so ready to be in Honduras, I’m not focused on the present. I find myself immersed in projects for the trip, rather than interacting with my children. Knowing I’ll be gone for almost two weeks, I should be planning and preparing freezer meals for my family, but I have not even committed to filling our refrigerator now or making meals for us to eat this week. I should be folding my children’s laundry so they have fresh clothes to wear, rather than worrying over what I will pack for the trip. I’m riding along, thinking about being there, so ready to get to the next place. I pray over my children all the time. Sometimes verbally and quite deliberately, other times just by breathing. Every time my daughters enter a new space or leave me, I look into their eyes and think, “God, please let them bless others and be safe.” I’m not alone in this. You do it too, don’t you? All of my friends pray for their kids, of this I’m sure. Mothers around the world pray for their children, whether it’s to the God of Israel, Allah, Buddha, or the universe. We pray from our deepest souls because our children are our hearts. Today is September 11, more than a decade after attacks on United States forever altered our way of thinking. People who carried out the attacks are known to us as terrorist, monsters, cowards. Their use of violence, death, and destruction to make a point was a low point for humanity. We don’t want to see images of their faces or even hear their names. They represent to us all that is evil. But on days like today I can’t help but think of their mothers. People who carry out deeds of hatred, like the 9/11 attacks, the massacre at Virginia Tech, the Cleveland kidnappings were once children. Children with mothers who loved them, hoped the best for them. How these women’s hearts must be broken! I cannot ask you to forgive the deeds. If you’re able to forgive to doers, that’s between you and God. But, I encourage you… Pray for the mothers. Our sisters in motherhood. Women who, by and large, did what they could to raise compassionate, responsible, caring adults. Somewhere, something went awry. The children made choices that would ruin their own lives and kill others. Perhaps the mothers themselves failed their children. One cannot fathom the burden of guilt they are left to carry. If we believe God is the God of forgiveness, that He sent His Son to die in our place, that He is able to redeem even at the moment of death, we can pray for these women. May they find in their hearts a yearning to seek God’s face. May they be filled with His peace. May they fall on their knees in reverence to the One who can banish that guilt and bring their hearts home to Him. “We will never forget.” Never forget the cowardess and hatred that spawned these acts. Never forget the heroism that saved hundreds. Never forget the sacrifice of many in the name of rescue. Never forget the patriotism and pride in our nation and unity. Never forget the forgiveness given to us that we may forgive others. New school supplies … we all love them! Freshly sharpened pencils, crisp white paper, erasers, and notebooks that hold the promise of learning and discovery. New clothes, shoes a half size too large, even new packs of socks and undies send children to school feeling confident, loved, and ready to tackle the world. What’s not to love? We wouldn’t think of having kids show up in worn-out clothes, deny them enough supplies or toys to get through the day, let alone the year, or make them wear dingy old undies and socks. But that’s how children around the world face each school day. Their needs are many, but their expectations are few. Small items as reward for the merit system in place: hair ties, colored pens, markers, cool erasers, hot wheel cars, hair bands, dollar store items etc. * Amazon users: If you use this link to make purchases at Amazon.com, H2H will receive a portion of the profits. Your Amazon experience will remain the same, but you’ll help the kids along the way. Bookmark it. ** Feel free to use Amazon or another site with free shipping and send items directly to me. Just be sure the package arrives by Tuesday so I have time to pack it!